The Langs' Fairy Books are a series of 25 collections of true and fictional stories for children published between 1889 and 1913. The best known books of the series are the 12 collections of fairy tales also known as Andrew Lang's "Coloured" Fairy Books or Andrew Lang's Fairy Books of Many Colors. In all, the volumes feature 798 stories, besides the 153 poems in The Blue Poetry Book. Andrew Lang (1844–1912) was a Scots poet, novelist, and literary critic. He initially edited the series and wrote prefaces for its entire run, while his wife, the translator and author Leonora Blanche Alleyne, known to friends and family as Nora, assumed editorial control of the series in the 1890s . She and other translators did a large portion of the translating and retelling of the actual stories, as acknowledged in the prefaces. Four of the volumes from 1908 to 1912 were published by "Mrs. Lang". According to Anita Silvey, "The irony of Lang's life and work is that although he wrote for a profession—literary criticism; fiction; poems; books and articles on anthropology, mythology, history, and travel ... he is best recognized for the works he did not write." 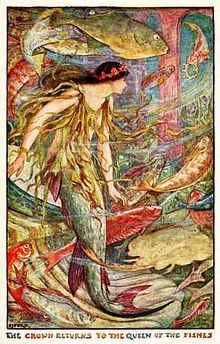 The 12 Coloured Fairy Books were illustrated by H. J. Ford (Henry Justice Ford)—the first two volumes shared with G. P. Jacomb-Hood and Lancelot Speed respectively, and the sequels alone. A. Wallis Mills also contributed some illustrations. The best-known volumes of the series are the 12 Fairy Books, each of which is distinguished by its own color. The Langs did not collect any fairy tales from oral primary sources, yet only they and Madame d'Aulnoy (1651–1705) have collected tales from such a large variety of sources. These collections have been immensely influential; the Langs gave many of the tales their first appearance in English. Andrew selected the tales for the first four books, while Nora took over the series thereafter. She and other translators did a large portion of the translating and retelling of the actual stories. Lang's urge to gather and publish fairy tales was rooted in his own experience with the folk and fairy tales of his home territory along the Anglo-Scottish border. British fairy tale collections were rare at the time; Dinah Craik's The Fairy Book (1869) was a lonely precedent. According to Roger Lancelyn Green, Lang "was fighting against the critics and educationists of the day" who judged the traditional tales' "unreality, brutality, and escapism to be harmful for young readers, while holding that such stories were beneath the serious consideration of those of mature age". Over a generation, Lang's books worked a revolution in this public perception. The series was immensely popular, helped by Lang's reputation as a folklorist and by the packaging device of the uniform books. The series proved of great influence in children's literature, increasing the popularity of fairy tales over tales of real life. It inspired such imitators as English Fairy Tales (1890) and More English Fairy Tales (1894) by Joseph Jacobs. Other followers included the American The Oak-Tree Fairy Book (1905), The Elm-Tree Fairy Book (1909), and The Fir-Tree Fairy Book (1912) series edited by Clifton Johnson, and the collections of Kate Douglas Wiggin and Nora Archibald Smith. But the three hundred and sixty-five authors who try to write new fairy tales are very tiresome. They always begin with a little boy or girl who goes out and meets the fairies of polyanthuses and gardenias and apple blossoms: "Flowers and fruits, and other winged things". These fairies try to be funny, and fail; or they try to preach, and succeed. Real fairies never preach or talk slang. At the end, the little boy or girl wakes up and finds that he has been dreaming. Such are the new fairy stories. May we be preserved from all the sort of them! The collections were specifically intended for children and were bowdlerised, as Lang explained in his prefaces. J. R. R. Tolkien stated in his essay "On Fairy-Stories" (1939) that he appreciated the collections but objected to his editing the stories for children. He also criticized Lang for including stories without magical elements in them, with "The Heart of a Monkey" given as an example, where the monkey claims that his heart is outside his body, unlike "The Giant Who Had No Heart in His Body" or other similar stories. However, many fairy tale collectors include tales with no strictly marvelous elements. The first edition consisted of 5000 copies, which sold for 6 shillings each. 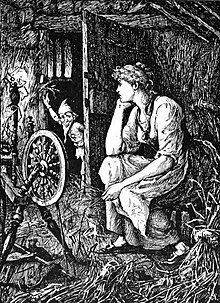 The book assembled a wide range of tales, with seven from the Brothers Grimm, five from Madame d'Aulnoy, three from the Arabian Nights, and four Norwegian fairytales, among other sources. The Blue Fairy Book was the first volume in the series, and so it contains some of the best known tales, taken from a variety of sources. It appeared at Christmas 1890 in a first printing of 10,000 copies. Sources include French, Russian, Danish, and Romanian tales as well as Norse mythology. Contains 153 poems by great British and American poets. Where Shall the Lover Rest? In his Preface to this volume, Lang expressed the view that it would be "probably the last" of the collection. Their continuing popularity, however, demanded subsequent collections. In The Green Fairy Book, the third in the series, Lang has assembled stories from Spanish and Chinese traditions. Contains twenty-four true stories, mainly drawn from European history. Its initial printing was 15,000 copies. The Yellow Fairy Book is a collection of tales from all over the world. It features many tales from Hans Christian Andersen. Contains thirty true stories, mainly drawn from European history. Includes the life of Joan of Arc and the Jacobite uprising of 1745. Contains sixty-five stories about animals. Some of them are simple accounts of how animals live in the wild. Others are stories about pets, or remarkable wild animals, or about hunting expeditions. Many are taken from Alexandre Dumas. The History of Jacko I.
Forty-one Japanese, Scandinavian, and Sicilian tales. Contains thirty-four stories from the Arabian Nights, adapted for children. The story of Aladdin is in this volume as well as in the Blue Fairy Book. Contains forty-six stories about real and mythical animals. Some of them are simple accounts of how animals live in the wild. Others are stories about pets, or remarkable wild animals, or about hunting expeditions. The Story of Jacko II. Thirty-five stories, many from oral traditions, and others from French, German and Italian collections. Romania, Japan, Serbia, Lithuania, Africa, Portugal, and Russia are among the sources of these 35 stories that tell of a haunted forest, chests of gold coins, a magical dog, and a man who outwits a dragon. Contains nineteen stories from various medieval and Renaissance romances of chivalry, adapted for children. Includes stories about King Arthur, Charlemagne, William of Orange, and Robin Hood. These 36 stories originated in Hungary, Russia, Finland, Iceland, Tunisia, the Baltic, and elsewhere. The Brown Fairy Book contains stories from the American Indians, Australian Bushmen and African Kaffirs, and from Persia, Lapland, Brazil, and India. Contains twenty-nine stories from various medieval and Renaissance romances of chivalry, adapted for children. Includes stories about Don Quixote, Charlemagne, Bevis of Hampton and Guy of Warwick. Includes 33 tales from Jutland, Rhodesia, Uganda, and various other European traditions. The Olive Fairy Book includes unusual stories from Turkey, India, Denmark, Armenia, the Sudan, and the pen of Anatole France. Published by Longmans as written by "Mrs. Lang"; illustrated by H. J. Ford (LCCN 08-28404). Contains fourteen stories about the childhoods of European monarchs, including Napoleon, Elizabeth I, and Frederick the Great. Published by Longmans as written by "Mrs. Lang"; illustrated by H. J. Ford (LCCN 09-17962). Contains twelve true stories about role models for children, including Hannibal, Florence Nightingale, and Saint Thomas More. The Lilac Fairy Book contains stories from Portugal, Ireland, Wales, and points East and West. Published by Longmans as written by "Mrs. Lang"; illustrated by H. J. Ford (LCCN 11-27934). Contains thirty stories on a variety of subjects, including true stories, Greek myths, and stories from Alexandre Dumas, Walter Scott and Edgar Allan Poe. What became of Old Mr. Harrison? Published by Longmans as written by "Mrs. Lang"; illustrated by H. J. Ford (LCCN 12-24314). Contains twenty-three stories about saints. Most of these are true stories, although a few legends are also included. Published after Andrew Lang's death, with an introduction by Mrs. Lang. Contains thirty-four stories on a variety of subjects, including ghost stories, Native American legends, true stories, and tales from Washington Irving. What Became of Owen Parfitt? ^ Day, Andrea (2017-09-19). ""Almost wholly the work of Mrs. Lang": Nora Lang, Literary Labour, and the Fairy Books". doi:10.1080/09699082.2017.1371938. ^ Anita Silvey, Children's Books and Their Creators, Boston: Houghton Mifflin, 1995; p. 387. ^ "Ford, H J". Encyclopedia of Fantasy (1997). Entry by RD. Reprint at sf-encyclopedia.uk retrieved 2016-10-31. ^ Roger Lancelyn Green, "Andrew Lang in Fairyland", in: Sheila Egoff, G. T. Stubbs, and L. F. Ashley, eds., Only Connect: Readings on Children's Literature, New York, Oxford University Press; second edition, 1980; p. 250. The Folio Society "Rainbow Fairy Books"
This page was last edited on 23 March 2019, at 21:13 (UTC).